Reaching political agreement on climate change targets and energy policy objectives at a higher level requires regional engagement. Regional self-sufficiency through the use of renewable energy (RE) with the emphasis on electricity and heat, combined with energy conservation, has the potential to make significant contributions to this aim. Municipalities and regions have the capacity to create the basis conditions necessary for overcoming implementation barriers, motivate citizens and businesses, and finally, stimulate participation and enhance value creation by decentralizing energy supply systems via regional and local self-governance processes. The overarching intent of the project is to analyze strategies aiming to achieve communal and regional energy self-sufficiency through the use of RE for power and heat generation, as well as compile their influence. A focal point is the consideration of the integrated use of biomass, focusing on environmental and social challenges and opportunities together with economic and technical aspects. 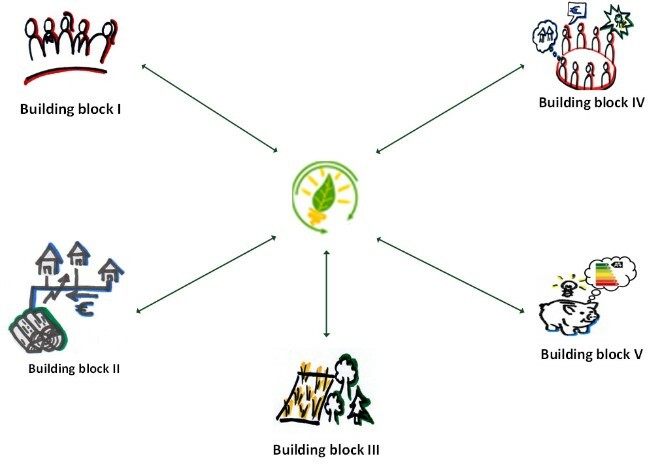 The project is centered around the following five interrelated building blocks. Building block-specified conditions for success will be defined and their correlation will be indicated. Practical recommendations for local decision-makers will be derived and a decision framework will be developed. This framework will be able to serve as a planning aids for the participants and help them undergo socio-ecological transformation to RE use. explores the decision-making and communication processes associated with the transformation of an energy system to a system based on RE at the regional and local levels, taking the social environment of the actors into consideration. Thus, inferences will be based on the composition of RE actor networks including value chain actors - in order to investigate whether or not they can be effectively governed and, if so, in what way. analyzes and evaluates regional energy concepts, emphasizing bioenergy. This analysis is based on comprehensive and systematic assessment taking two factors into account: (1) the internal of potential RE conversion system, especially for biomass, and (2) integration into a conventional energy system in terms of technology, ecology, and economics. explores the impact of biomass cultivation on landscape structures as well as on habitat functions and their interconnectedness. Taking economic aspects into consideration, concepts of ecologically sustainable cultivation will be developed. The risk potential associated with land use choices will be indicated and changes in the landscape will be ascertained. Another objective is to develop a module titled "nature conservation" aimed at ecological balance. examines the perceptions, attitudes, interests, and behaviors of residents towards the goal of attaining local self-sufficiency through the use of RE. The findings will allow conclusions to be drawn about how the barriers associated with the arrangement of basic local conditions can be recognized, acceptance can be raised, and demands for RE can be stimulated. explores why particular emphasis is placed on the reduction of absolute energy consumption within regional strategies aiming to reach self-sufficiency via RE usage. At the same time, previously implemented measures will be analyzed in order to identify additional energy saving potentials.